Kim Il Sung was born on April 15th (now one of the most important national holidays in the DPRK, as is Kim Jong Il's birthday) 1912 in Mangyongdae just outside of Pyongyang. He led the Democratic People's Republic of Korea from the day it was founded to the day of his death. Officially known as the "Great Leader", he is also "Eternal President of the DPRK". He developed the Juche Idea, an ideology that stresses the need of self reliance and which is central to North Korea's official line of thought. 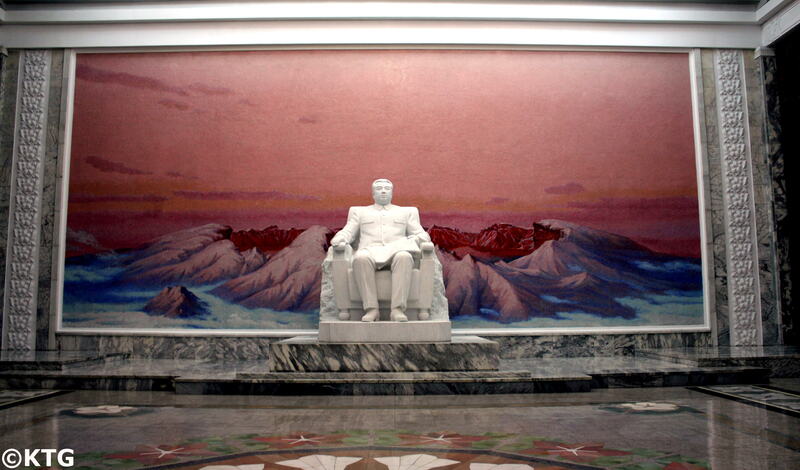 A cult personality has also been developed in North Korea and there are countless monuments, murals, paintings, etc built portraying "The Great Leader" as President Kim Il Sung is also referred to in the DPRK. In 1925 Kim Il Sung goes to China with his family, according to official accounts to help liberate Korea from the Japanese. He went to middle school in the northeastern Chinese province, Jilin, Manchuria. Here he grows interest in communism and becomes politically involved to such degree that he is arrested in 1929 for being a communist youth group member. At this time Korea is occupied by Japan who is also making itself present in China. He becomes a member of several anti-Japanese guerrilla groups in Northeast China, cooperating with groups led by the Communist Party of China. At the young age of 24, he is appointed head of the 6th division aka the Kim Il Sung division, leading a few hundred men. On June 4th 1937 his division manages to capture Pochonbo, a Japanese occupied town. This is considered a great military success at the time, given difficulties the guerillas had in fighting any territory from the Japanese. He is popular amongst Koreans for his fighting against the Japanese. The Korean People's Revolutionary Army (KPRA) is formed by him in the 1930s; an army force built to fight the Japanese. However one of his biggest achievements is the formation of the Korean's People Army (KPA), in 1948. Stemming from the KPRA, this is a professional army formed from soldiers and guerrillas who fought the Japanese and later the Chinese Nationalists (thus having helped the communists come to power in China). With the support of the former USSR, Kim Il Sung manages to build a large army specialising in guerilla warfare, having an air force and modern military equipment. Just after returning back to Korea (now free from the Japanese), on October 10th 1945 he founds the North Korean Communist Party (now called the Workers Party of Korea) and in 1946 becomes head of the Provisional People's Committee. On the 9th of September 1948 The Democratic People's Republic of Korea was founded and he becomes Head of State. In early July 1950, he is elected Supreme Commander of the Korean People's Army. 3 weeks later, on June 25th, the Korean War breaks out, ending in July 27th 1953 leaving the Korean peninsula devastated, with an estimated number of over 3 million death casualties and the peninsula divided at the 38th parallel. The years following the war the now Head of State of the DPRK focuses on rebuilding the country. The economy is centralised, abolishing the differences in classes and focusing primarily on heavy industry. 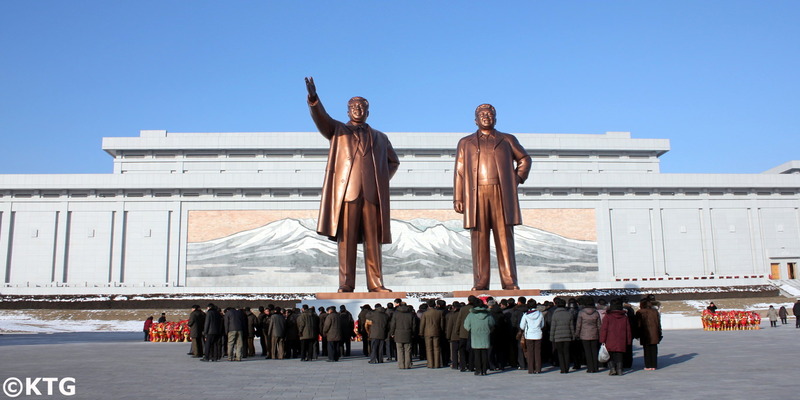 The figure of Kim Il Sung becomes increasingly important in the DPRK, with his image being increasingly present all over the country. His life, stories based on him and his personal characteristics are taught throughout the educational system. Citizens are to wear a pin of his image. In 1972 a new constitution is passed and Kim Il Sung becomes president of the DPRK. On the spot guidance in factories, workplaces become common, eventually with the participation of his son Kim Jong Il. Important: please note that the figures of Kim Il Sung and Kim Jong Il are highly respected in the DPRK. Travellers should under no circumstances show any signs of disrespect to them, the regime or the DPRK. You will be sent more specific information regarding this before travelling to North Korea. His foreign policy engages in visits to other communist countries including the USSR and China even when conflicts arise between the two communist giants. The "Great Leader", however, avoids being a Soviet satellite and always keeps a distance from these countries, focusing on the importance of being an independent nation and basing the national ideology on the self developed philosophy of Juche. He is involved in talks with the Republic of Korea (South Korea) on several occasions regarding reunification, although tensions do spark with the ROK and US. One particular conflictive incident is the 1968 USS Pueblo Crisis. Kim Il Sung is awarded the Hero of Korea award on several occasions. On June 16th and 17th he receives former US president Jimmy Carter. On June 19 he meets Miki Mutsuko, the widow of former Japanese Prime Minister Miki Takeo, and her family. Hardly a few weeks later, on July 8th 1994, Kim Il Sung passes away from a heart shock as a result of myocardial infarction due to heavy mental strains. His death is seen as a national tragedy, with hundreds of thousands crying at his funeral. 3 years of national mourning follow. In 1997 he is proclaimed "Eternal President of the Democratic People's Republic of Korea." Please click on the Juche link to see more information about the philosophy created by Kim Il Sung.